Roberta ‘Bobbie’ Rowe is not the kind of person who believes in ghosts. A Halloween dare at her ridiculously spooky boarding school is no big deal, especially when her best friend Naya and cute local boy Caine agree to join in too. They are ordered to summon the legendary ghost of ‘Bloody Mary’: say her name five times in front of a candlelit mirror, and she shall appear… But, surprise surprise, nothing happens. Or does it? Next morning, Bobbie finds a message on her bathroom mirror… five days… but what does it mean? And who left it there? Things get increasingly weird and more terrifying for Bobbie and Naya, until it becomes all too clear that Bloody Mary was indeed called from the afterlife that night, and she is definitely not a friendly ghost. Bobbie, Naya and Caine are now in a race against time before their five days are up and Mary comes for them, as she has come for countless others before… A truly spine-chilling yet witty horror from shortlisted ‘Queen of Teen’ author James Dawson. I’m not usually that into horror. The most horror-y I usually go is watching Supernatural or Stranger Things, both tv shows that I love. I guess you can say I’m more into creepy paranormal than outright horror. So when I heard about this book, based on the urban legend of Bloody Mary, I decided to give it a try. And I must say, I really enjoyed it! Don’t get me wrong, this is still a scary book. It creeped me out and made me really uncomfortable in bathrooms and any other place with big mirrors for quite a while. But this story is not ONLY about the scares and the creep-factor. It’s about finding out what happened to Mary, what she wants and how she works. There is a lot of mystery in the story, and that is what got my attention. It also helps that the main characters were quite likeable and felt like fully-formed multidimensional characters. Bobbie is a great heroine to root for, Naya is a fun but supportive best friend and Caine was also more than just your average love interest. And yes, there is some romance in this. But I felt it was well done and did not take away from the main story at all. On the contrary, it was interwoven in the story in such an interesting way – it added to the mystery instead of feeling like something just written in to have it in there. Everything about this book worked. The writing, the setting, the pacing, the mystery and the characters all worked together to give you one big scary story that could have been an episode in Supernatural (There actually was one – it creeped me out just as much as this book). I’m keeping this short to avoid spoilers, but if you like paranormal stories, urban legends and you don’t mind feeling nervous in bathrooms for a few days while reading this, I highly recommend Say Her Name! 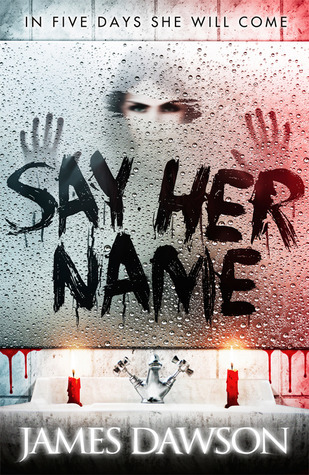 Have you read Say HEr Name? What did you think about it? Yay! So glad you enjoyed this Lindsey. I loved the setting and it creeped me out enough to make me want to avoid bathroom mirrors for a while haha. Great review!